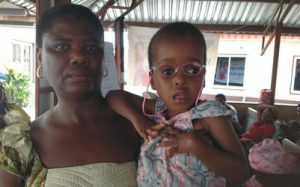 The Festus Fajemilo Foundation in partnership with Pro – Optics eye clinic provide free eye screening & glasses to children with spina bifida and/or hydrocephalus (SB/H). 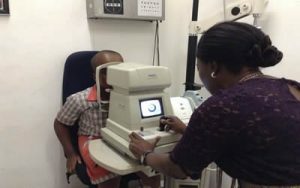 Children with SB/H sometimes have challenges with sight which require continuous eye checks, while some require eye glasses to correct their eye defects. 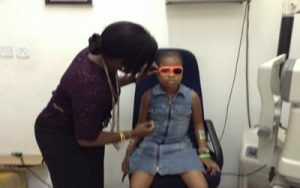 Pro – Optics is a renowned eye clinic located on Victoria Island in the commercial city of Nigeria, Lagos. 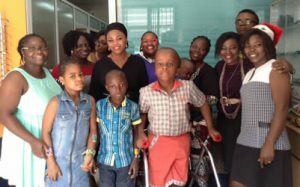 Thanks to the Principal Partner Dr. (Mrs) Ogechi Nwokedi who is also an Advisory Council member of the Foundation for being the brain behind this initiative. We also appreciate the entire Pro – Optics team for their love to the FFF family.